Fleshy rosettes, brightly coloured flowers. A very popular plant with bright, colourful flowers in late spring and through summer carried on strong stems over rosettes of fleshy leaves. The flowers really do have that 'Wow!' factor. 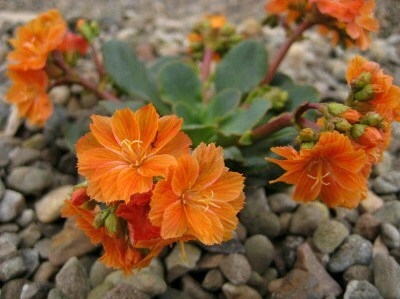 Lewisia are generally easy to grow, enjoying a fairly rich but well-drained soil. They need very free drainage, especially around the neck of the plant in the form of grit or gravel to help water drain away quickly. Another tip is to plant the plants slightly at an angle so that water cannot collect in the plant's fleshy heart. Following these few simple tips should ensure a wonderful display of flowers. Lewisia also make superb specimens for pot growing - they can even be grown in a cool porch or conservatory where you can enjoy flowers even more. Two tips here - use a John Innes (or soil-based) compost with some added grit and an occasional watering with liquid tomato fertiliser will have the plants bursting with flowers. Sorry, but as these are seed-raised plants we have no way of telling the colour until they flower, so you will have to take 'pot luck'. We raise these from seed saved from plants we specially select. Left to their own devices, we would end up with a fairly dull choice in shades of pink, but this selection will include reds, deep pinks, neon cerise, waxy white and colours like this vibrant orange beauty pictured above. We especially like the orange shades.